GRAS26AI is a preamplifier designed for low-frequency applications in the laboratory and field and accommodates directly for all IEC 61094 standardized 1/2" externally polarized measurement microphones. It is rugged and reliable and can handle microphone signals up to 50 Vpeak within 1 Hz to 200 kHz. The printed circuit board is made by use of thick-film substrate technology and optimized with respect to maximum suppression of microphonics and moisture rejection. The high-quality, standard 7-pin LEMO male connector is integrated into the preamplifier and ensures that only one type of connector and cable is required for both connection and extension. 26AI is factory calibrated individually and delivered with a calibration chart stating its A-weighted and linear self-noise. These preamplifiers are compatible with 1/2-inch microphones as defined in international standard IEC1094 Measurement Microphones, Part 4: Specifications for working standard microphones. The mounting thread (11.7 mm - 60 UNS-2) is compatible with other available makes of similar microphone preamplifiers. 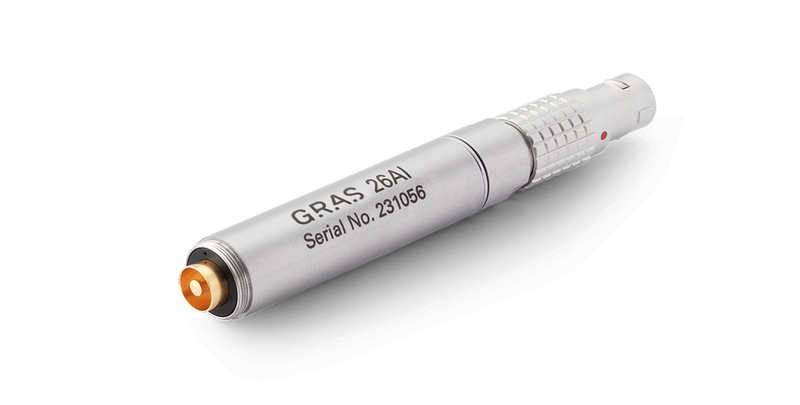 GRAS 26AI is provided with an integrated 7-pin LEMO series 1B plug.